A look at Carlsberg's Re-Brew project and a similar one from Heineken with their H41 lager. A few weeks ago, I was invited along to the Irish launch of Carlsberg's Re-Brew, a fascinating project as it turns out. It took place at the Dublin Science Gallery which like most museums in Ireland, is free to visit. It was fitting that we passed a number of microscopes before heading upstairs to the event because this launch was all about one thing; Yeast! The story goes as such. While looking around in their cellars, they found a case of old bottles of Carlsberg from 1883. This was very exciting because the bottles had been bottle conditioned meaning the original Carlsberg purified yeast was still in the bottle. Carlsberg are sort of the forefathers of modern lager production, having essentially isolated Saccharomyces Pastorianus, also sometimes referred to as Saccharomyces Carlsbergensis. This was the first commercially available lager yeast. It's a hybrid strain from Saccharomyces Cerevisiae (standard ale yeast) crossed with Saccharomyces Eubayanus which was found in Patagonia. With me so far? Carlsberg didn't hoard their discovery though, they freely shared it with any brewery that wanted it. That probably helped secure lager as the dominant beer style around the world. They had the brewing records from back then so were able to re-create the same beer in the bottle using the same malt, even malt produced in the same way. They had the yeast, they had the malt, they had the recipe. Presumably they even had an idea of the water profile from back then. They even went so far as to hand blow the glass used for the bottles using the same techniques from the day. At least, the first 30 or so. I have little doubt that the ones we received on the night were normal, modern bottles. 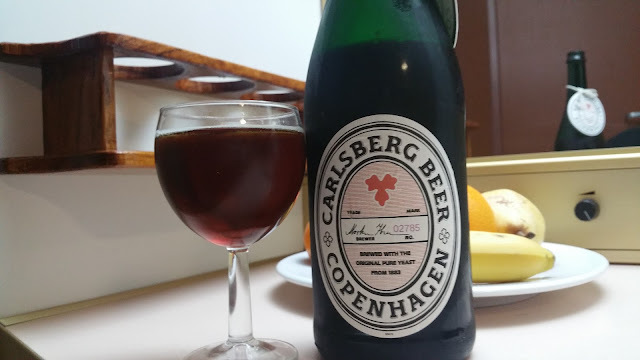 So how does this old Carlsberg differ from the modern version? Quite a lot actually. I tasted it properly on the ferry to France recently as Carlsberg ha provided a bottle to bring home. Re-Brew is bottle conditioned, just like the original bottle that was found. Also, it's more like a 5.8% ale than a pale lager. The colour is dark ruby with a short lived white head. The aroma is big on caramel malt with no hops that I could detect. Pretty much like an Irish red ale actually. How did it taste? Think Irish Red but slightly cleaner. Some chocolate, caramel and slight coffee with lots of dark fruit. It's a bit on the heavy side but pretty tasty actually. It's also worth mentioning that at the launch party, they brought along some other Carlsberg products, one of which was unmarked. When I asked what it was I was informed that it's a 20 year old bottle of Carlsberg. I was intrigued so I of course tried it. As you might expect, it was pretty much undrinkable since lagers don't age for long periods very well but surprisingly, the dominant off-flavour was oxidisation and it thankfully took the form of sherry. A few sips of a nice sherry like beer were fine, any more might not be so great due to the cloying nature of the oxidisation. There are better beers out there that will age nicely and give you those sherry notes along with a body that can handle it but it was really interesting to try it. A few weeks previous to that, at the European Beer Writers Conference in Amsterdam, we were treated to a similar project from Heineken. In this case, they travelled to Patagonia and retrieved some of that Saccharomyces Eubayanus I mentioned earlier. They then brewed H41 lager. This one is a lot closer to the modern equivalent but still very different. If you are wondering about the name (I did), it's taken from the latitude of the forest in Patagonia where this yeast was discovered. Unlike the Carlsberg Re-Brew, this is a slightly different idea. It's a series of beers called Lager Explorations, the first being H41. It sounds like they're just going to have a little fun and try to unlock different flavours you don't get with their modern, clean yeast. I can only describe it as tasting a little like Heineken but with ale-like fruity esters. It's still pretty refreshing and clean like a good lager should be though it's filtered and pasteurised so that probably helps. There's a spicy note, pretty much the clove-like, phenol you get in many Belgian style beers. 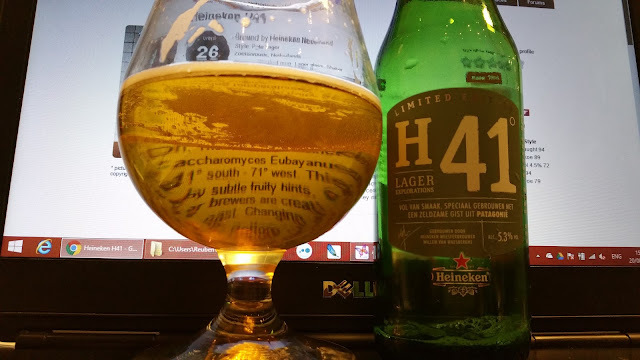 I prefer H41 to the regular Heineken myself as it's more interesting to my palate. 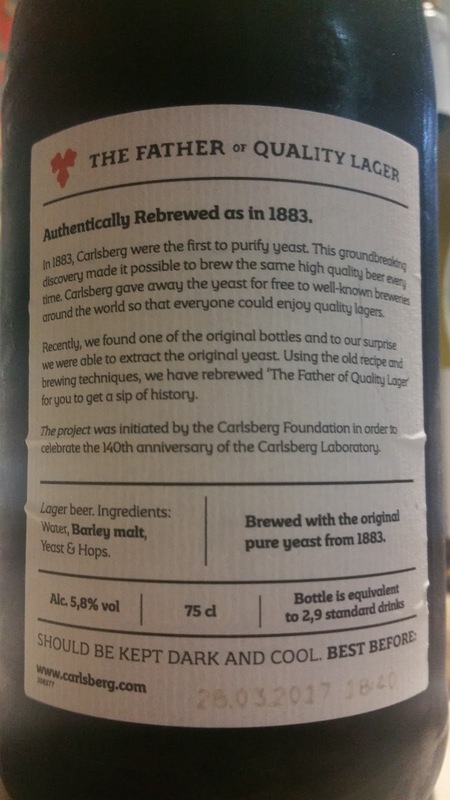 For me, Carlsberg Re-Brew was a little more interesting but it's good to see the big boys doing cool things with yeast on a limited basis like this. It makes the beer world more interesting. I'm just back from France with a couple of days in San Sebastian, Spain for good measure so I'll be writing about that. However much of that content isn't beer related so will be appearing on my non-beer related blog: www.reubengray.com.